The Property Management App Connecting Landlords, Tenants, Property Professionals & Contractors. 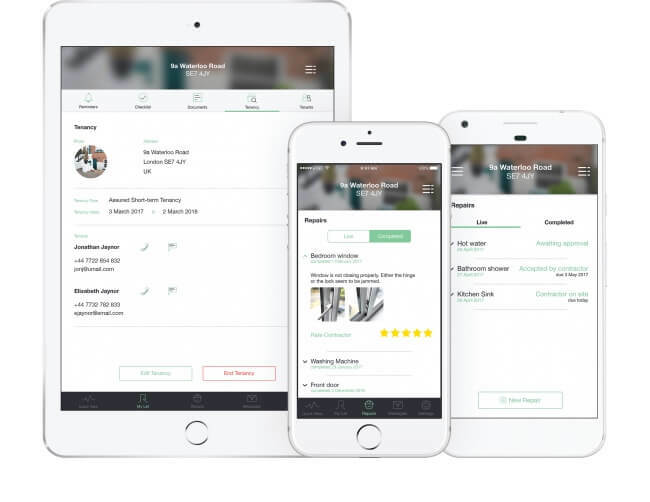 Anabode is an indispensable property management app that provides value, control, and peace of mind throughout the rental process. Available for both long-term and short-term tenancies anywhere in the world, Anabode provides the perfect solution for smart landlords and property managers who recognise that happy tenants and smooth rentals go hand in hand. Anabode’s easy to use communication tools ensure that clarity is maintained throughout the tenancy. Email, call, private or group message tenants or contractors at the touch of a button. Don’t let maintenance requests catch you off guard. Add your own contractors for on-demand service response, or vetted service providers are available in certain cities ready to take care of everything. Private rented property licences, EPCs, gas certificates, deposit protection – the list goes on. The Anabode team regularly reviews key compliance requirements so that you can stay up to date. No more searching for that old tenancy agreement. Upload all important documents to Anabode’s secure cloud-based repository allowing easy access for both you & the tenant wherever you are. Never forget a tenancy end date again. Automatically keep track of all those key tenancy details, including dates & contact information, & keep all your tenants instantly updated with any changes. When all those small jobs start piling up its easy to forget things. Auto-compiled property specific to do lists, email reminders & home screen prompts ensure that you stay on top of them all. Anabode provides the complete solution for managing serviced appartments, short-term holiday rentals, or city appartments, whilst also providing a more personal experience for your guests. Anabode takes care of all types of rentals including HMOs (houses in multiple occupation). Tenancies are set up by room with communications aligned to private individuals or tenant groups. Whether you require integration with your financial software or internal management systems, or even something more bespoke, the Anabode team will be more than happy to help you out. Managing my London flat is so simple now, even though I live abroad. I was impressed by how easy it was to add and communicate with my own contractors. It's great to have such an intuitive tool to manage my tenants and repairs. It has totally freed up my spare time. I work with many overseas landlords, and now my team and I can manage their portfolios as an add-on service. I no longer have to worry about finding someone reliable and well priced to carry out repairs and maintenance. Create your own on-demand maintenance service by adding your own contractors & service providers. Allow them to respond to job requests & handle the whole process from start to finish. Clear communication & transparency are paramount when there’s a job that needs doing. Contractors are able to provide before & after photos & videos, as well as status updates throughout the process. Be it gas, electrical, plumbing or anything else, 24 hour emergency service providers can be set up easily in Anabode, ensuring that you are never caught out when a job needs doing fast. A select number of trusted service providers are ready to help if needed. These service providers must adhere to a strict charter, upholding our core principles of value, quality & reliability. Vetted service providers are customer-assessed against a variety of criteria such as time-keeping, commmunicaton & quality. They must maintain premium star-ratings in order to remain trusted. Vetted service providers undergo strict evaluation & regular reassessment, covering work, premises, documentation, equipment, & staff in order to maintain their industry accreditations. Free, full function access will be provided to all landlords and property management professionals who join us whilst we are in beta. If you are interested in becoming one of our beta users then please register your interest below so that we can keep you up to date as we progress towards launch. As a beta user you will enjoy all the benefits of Anabode for free (no credit card required). All we ask for in return is your feedback. Thank you for registering your interest. One of our team will be in touch shortly. We look forward to keeping you up to date as we progress towards our beta-launch.